I hate mosquitoes. I love to hike and camp, but I hate using bug spray to keep these nasty pests away. Well, scientists are growing, or actually I should say they are bioengineering mosquitoes to create a vaccine against malaria. If the vaccine is successful, then I think we'll have a really serious global population problem on our hands. 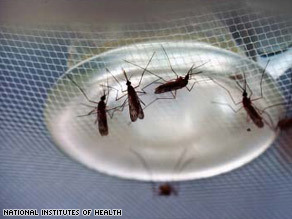 It may be strange to think that malaria actually controls the world's population in certain areas of the globe. If a vaccine eradicated malaria the same way a vaccine eradicated smallpox, then the who knows what would happen to the world's population. Maybe countries may need to enforce one-child policies that are found in China. Who knows? But this would lead to a very interesting public health ethical dilemma.